Le Bon was an eminent psychologist and sociologist. 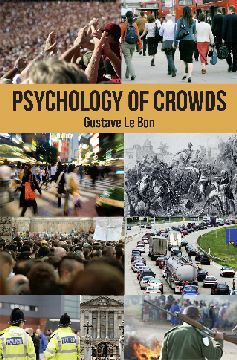 The ideas Le Bon explores in Psychology of Crowds are extremely relevant to today's society and were of pivotal importance in the early years of group psychology: Sigmund Freud's Massenpsychologie und Ich-Analyse (1921); (English translation Group Psychology and the Analysis of the Ego, 1922) was based on Le Bon's work. The orginal of this work, La Psychologie des Foules, was first translated anonymously into English possibly by a group of French students. Sparkling Books has corrected errors and anomalies in the original translation by reference to the Alcan edition. We have shortened a few passages but maintained the original footnotes and have added some footnotes of our own. ISBN: 9781907230554 price may vary. USA: Barnes & Noble books-a-million Bookshout! This book explains how politicians use images to address electoral crowds.